This convenient 4 pack of cartridges is compatible with American Plumber water filter model WGCHD. 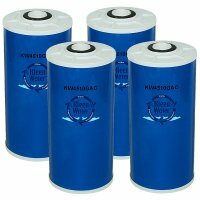 This filter cartridge reduces chlorine, chloramine and other contaminants that effect water taste and odor via the process of adsorption. Adsorption is the capability of all solid substances to attract to their surfaces molecules of solutions or gases with which they are in contact. The striking difference between adsorption and absorption is adsorption allows molecules to adhere to surface area whereas absorption allows molecules to penetrate internal past their surface. To efficiently apply the adsorption process it is vital to maximize surface area. Hence activated carbon is an ideal media to employ. The large surface area of carbon has many attractive forces that work to attract other molecules. Thus, contaminants in water are adsorbed to the surface of carbon by attractive forces similar to gravitational forces. The process of filtration adsorption will provide "bottle quality water". The "industry standard" dimension is suited for point of use applications capable of sustaining 4 gallon per minute flow rates. The KWGAC4510 should be changed every 6 months or upon substantial flow rate reduction. This cartridge is a "low cost high Quality" alternative to American Plumber WGCHD Drinking Water Filter.